I’m sitting in the dugout and I tell my team mate, “If only I could catch a foul tip pop up!” She says, “You will! You’re improving every game, just keep trying!” I think to myself, well one day I will do it. Then the next inning comes up and I am standing behind the kicker in my catchers position and she kicks a foul tip pop up and “WHAM” I catch it!! Woo Hoo!! I did it!! YES!! I then throw the ball to 2nd base for a double play!! Best time I ever had in Kickball! That my friends was just last night. I am quite the novice kickball player but some friends of mine play kickball and have for years. Last year I was asked to join a team and even though at the time I didn’t even know the rules, I joined. Being kind of introverted I don’t meet a lot of people so this was just what I needed. I have met young and “older” ladies that are really remarkable people and have made some really great friends in the 2 years I have been playing now. Our games are played at Balcones Sports Complex. We have the best fans and we invite you to come out and cheer on your favorite team! 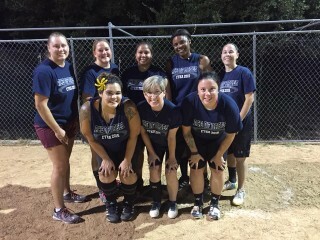 If you can’t make it out on a Thursday night try to come to our Central Texas Kickball Austin Tournament on September 12th and 13th. The tournament is held at the Murchison Middle School Kickball Fields. Games start at 8:30am and will go on all day and into the evening hours so there’s lots of time to catch a game! The Team at 12 Oaks Dental put it to the test! Dentists are considered “surgeons”- surgery being defined as “handwork” – we definitely put our hands to work! We had a fantastic time at Painting with a Twist. 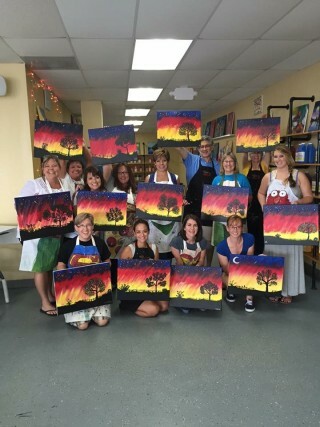 We chose a design of our (group) choice and each of us was presented with a blank canvas, paint and paint brushes, fortunately a great instructor to go with it. Step by step instructions were given and we added our own flair to each brush stroke. Masterpieces were created even by those who were a little skeptical of their own talents! It may not have been as tedious or as rewarding as restoring patient’s smiles, but we all had lots of fun and off time together and enjoyed seeing the creative side of each other ! Great Venue ~ You can bring your own snacks, beverages and listen to music while your paint! Fun activity for a group any size or for any occasion! You wake up each morning, eat your breakfast, then head to the sink to brush your teeth and give your grin a thorough flossing. You’re doing everything correctly, right? Maybe. The truth is, oral hygiene isn’t as simple as just making sure you brush and floss. 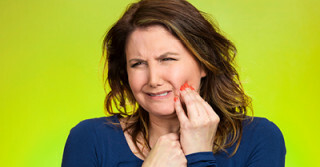 At our Austin dental office, we’d like to talk about a few common oral health mistakes and how to fix them. Following the proper guidelines of great oral hygiene is crucial for a healthy smile. But it’s only half of it. Maintaining regular visits to our dental office in Austin is also incredibly important. Routine visits ensure there are no problems that may be caused by your at-home care and allow us to catch and treat any issue we may find quickly and more easily.